Sakaiya Taichi started out as an elite civil servant in Japan’s Ministry of Trade and Industry, before establishing himself as an author of novels, history and business books in the late 1970s. 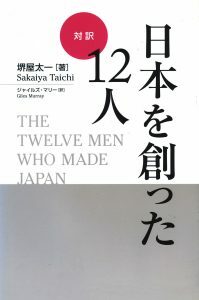 The Twelve Men Who Made Japan is Sakaiya’s take on the men who created the social institutions of Japan and exerted the greatest influence on the national psyche. His selection includes fictional characters such as Hikaru Genji (from The Tale of Genji) whom Sakaiya regards as the archetype of the effete aristocrats who led the country into World War II; business leaders like Matsushita Konosuke, founder of Matsushita electronic Industries and originator of the lifetime employment system; even General Douglas MacArthur. Sakaiya seeks to link the habits of thought inculcated by the twelve men to the economic malaise that bedeviled Japan throughout 1990s. This book was specially translated for a course of lectures given by Sakaiya at Yale in the 2003 winter semester.